We continue our fantasy baseball tiered rankings analysis with the third base position. 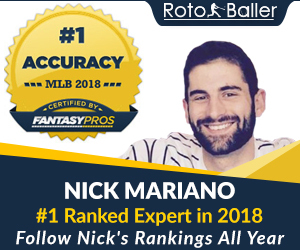 Even though it is only January, RotoBaller writers Nick Mariano, Pierre Camus, Chris Zolli, and I have come up with our initial pre-draft rankings to give you a sense of player values as early as possible. As the offseason progresses, these rankings are sure to change quite a bit over the coming months. 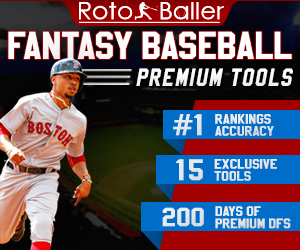 We'll be updating our rankings on a regular basis, so be sure to keep checking in on our fantasy baseball rankings dashboard for the most updated lists. The hot corner is possibly the hottest it has been for years, I mean four third basemen ranked as first-round values!? Truthfully though, five of the first six third basemen on our list won't actually be drafted to fill the third base slot in fantasy lineups due to multi-position eligibility. That means you need to pay more attention to the third and fourth tiers, which is when you really need to fill the 3B void. If you wait until after the fourth tier, you will regret it. Take heed! In case you missed it, you can read about the first base position here. Without any more delay, let's take a look at the 2019 third base rankings for January. After a surprise breakout campaign in 2017, very few, if any fantasy players were expecting Jose Ramirez to take it to an even higher level in 2018. The 26-year-old’s encore performance consisted of career-highs in Runs (110), HR (39), RBI (105), and SB (34) en route to a top-five fantasy ranking. This newfound power came at the expense of his BA, however, as he set his sights on the bleachers. He became a top-ten fly-ball hitter with the second-highest pull-rate in the majors, and it dragged JRam’s BABIP down over 60 points from 2017. The only thing that Ramirez has going against him in 2019 is the departures of Edwin Encarnacion, Yonder Alonso, and Michael Brantley this offseason. The lineup currently slated behind him looks rather bleak, and the possible effect on the Run scoring opportunities widens the gap between JRam and the Betts-Trout duo at the top of fantasy boards. Nolan Arenado, our 3B2, is the only sole-third base guy in the top tier. But he makes up for it by playing in Coors and quite possibly being the most consistent fantasy performer over the past four years with at least 37 bombs, 97 R, 110 RBI, and a .287 BA every year since 2015. Where is Manny Machado going to sign? I don't have the answer, but honestly, does it matter? If he can be fantasy relevant with the Orioles, he can play anywhere and we'll still like him as a first rounder. Both Philly and the Bronx are great hitters parks and both lineups have plenty of firepower for run-scoring opportunities. The 26-year-old is coming off his best offensive season, where he matched his career high in HR and set new marks for RBI and BA. If he ends up in NYY or PHI, he's easily the 3B3 for 2019, but if he surprises everyone and ends up in the Southside of Chicago then he probably gets bumped down to 3B4 in favor for the next stud. That next stud is Alex Bregman. Fantasy aside, this kid is a phenomenal hitter. His 1.13 BB/K ratio was the third-best in all of baseball and his 157 wRC+ beat out Arenado and Machado. He's slated to hit in the two-hole behind George Springer and in front of Jose Altuve, Carlos Correa, and Michael Brantley. If the elite plate discipline continues, then Bregman is a serious threat for reaching triple-digit runs and RBIs again in 2019 along with 25+ HR and 10+ SB with a BA hovering around .290. If you can snag him after the first turn in the second round, the LSU product will easily return value this season. People often forget this guy is still just 24 years old. One tier with two Cubbies, both carrying a significant amount of risk for different reasons. Javier Baez went from a 98 wRC+ in 2017 to N.L. MVP runner up one season later. He was one of just seven players to hit 30 HR with 20 SB, and put up triple digits in both run scoring categories. All of this goodness while still striking out in a quarter of his bats for the third straight year. Can he keep up this level of production with such poor plate discipline? First off, the BA is not sustainable. His 25.9 K% ranked 14th highest in the league. Among those 14 batters, Baez had by far the highest BA, with the next closest (Giancarlo Stanton) being a whole 27 points lower. We expect the BA to drop down closer to the .273 he posted in back-to-back seasons in 2016-2017. Also, the power is bound to regress. Baez only hit a 32.3 flyball rate, with a 1.41 GB/FB ratio. Those certainly aren't prototypical power hitting profiles. On top of that, his 24.3 HR/FB% just simply isn't repeatable with his 35.8 Hard%. Bottom line, yes we expect some regression from Baez in 2019. But the bottom-bottom line is that he hits cleanup for the Chicago Cubs and has legit speed that should produce 19-21 SB again. The talent and situation should still outweigh the regression, which is why we have Baez as our 3B5 and ranked as a late-second/early-third round talent for 2019. Baez's teammate, Kris Bryant, went the opposite direction in 2018, after being drafted as a first/second-round fantasy player. He started the season as advertised, hitting .291/.441/.506 in April and .282/.368/.536 in May with 156 and 140 wRC+, respectively. That's the good news for 2019 fantasy owners. But then the bad luck struck. He was first hit in the head with a pitch, then missed an entire month with a shoulder injury. Upon returning from the shoulder injury, he was struck on the hand with a pitch. That kind of physical abuse can understandingly mess with a hitters psych, and his rest of season numbers proved as much. In his last 32 games, he hit a lousy .749 OPS and .150 ISO, with a 105 wRC+. With a full off-season to recover and reflect, there's little reason to worry about KB. The three previous seasons saw a floor of 26 HR, 87 R, 73 RBI, 7 SB, and a .275 BA, with a ceiling of 39 HR, 121 R, 102 RBI, 13 SB, and a .295 BA. Which end of the spectrum you believe he bounces back to this year will dictate where you are willing to draft the 27-year-old. Our ranking of #6 3B and 29 overall shows that we believe he will end 2019 near the center of the two stat-lines. Matt Carpenter enjoyed a career year in 2018, going yard 36 times and scoring 111 runs. Carp has always been one to tear the cover off the ball, but he has taken it to new heights after leading the entire league with an absurd 49.0 Hard%. We'd love to say we expect HR regression in 2019, but when someone is doing that to the baseball where do you expect it to go other than the stands?! His 19.1 HR/FB% was actually the lowest among hitters in the top-five Hard%. The Cardinals lineup should produce plenty of runs this year, and their powerful leadoff hitter will thrive again. I've always been a Carpenter fanboy thanks to the hard-hit rates and OBP, but the multi-position eligibility really boosts his value for me - hence the fourth-round ranking. He finished 2018 as the 35th ranked player in fantasy and has the top first basemen in baseball hitting behind him this year. We have Carp ranked 30 spots ahead of his current NFBC ADP of 73.00, but will gladly take the value opportunity. Eugenio Suarez and Anthony Rendon are ranked back-to-back in our rankings, as they are in mine as well. I perceive both players similar in overall value for 2019. Suarez is the more excitable upside pick, after busting out 34 bombs and 104 RBI with a .283 BA last season. He saw a five-point spike in HR/FB%, but an absurd 15-point spike in Hard-hit rate up to 48.6% which was tied for second-highest in baseball. His 8.4 Soft% was the lowest in the league, just in front of his teammate Joey Votto. Rendon represents a safer floor and draft pick at the projected fourth-round ADP. You know what you are going to get from him, as he's given fantasy owners the same level of production for three straight seasons. The downside is the lack of prototypical 3B power, but the upside is a BA over .300. Which guy you take really depends on the setup of your lineup. If you played it safe and avoided power at the top of your draft with say a Trea Turner/ Jose Altuve combo, then you will want the HR-upside of Suarez. Whereas if you have ample power with little BA coverage with Giancarlo Stanton/ Khris Davis, then Rendon is your guy. There is nothing safe about this tier, but it is dripping with upside. The perfect example is the 2019 hype-leader Vladimir Guerrero Jr. The guy has never played at the MLB level, yet Steamer projects him to hit 22 HR with a .306 BA this season. The crazy part is it's not even a little bit far-fetched. The NINETEEN-year-old hit 20 combined HR between AA and AAA last season, along with a .402 and .336 BA respectively. Over his 30 games at AAA, he boasted a 1.50 BB/K ratio. He looks like the most polished prospect I have seen in a long time, and should be up with the big league club for good after the service time date passes. I value Vlad Jr as Anthony Rendon-type talent for 2019 but in a worse lineup, and have him ranked as such. After being burned by getting zero shares of Ronald Acuna last season, I will be sure to get a least a little exposure of this year's top prospect if he's still available in the sixth round. His current NFBC ADP of 38.56 is an easy pass for me this season. Miguel Andujar is another youngster at the position but now has a full successful season under his belt. He was beat out by the freak of nature Shohei Ohtani for AL Rookie of the Year after hitting 27 HR with a very respectable .297 BA. The problem with Andujar is 2018 may be the ceiling for fantasy production. The fly ball and hard hit rates don't support big power numbers, and I expect some regression on his .316 BABIP. While I see little-Guerrero as a Rendon in a worse situation comp, I see Miguel Andujar as a poor man's Rendon in a good situation. He will play every day in a monstrous lineup, hitting in a little league sized ballpark. Even with a slight step backward in the HR and BA departments, the run-scoring potential makes Andujar worth a starting 3B slot in your lineup if you've held out on the position thus far. We have Andujar ranked 27 spots lower than his 65.21 NFBC ADP. The last two in tier three carry significant health risk but are also huge upside picks. Josh Donaldson is 33 years old now and hasn't played a full season since 2016. But he is also just one year removed from hitting 33 HR with a .270 BA. He joins a young Atlanta Braves team and could be hitting clean up behind Ronald Acuna, Ozzie Albies, and Freddie Freeman. His counterpart, Wil Myers is also full of talent that also hinges on his ability to stay healthy. Like Donaldson, Myers is just one year removed from a successful season in which he pulled off a rare 30/20 campaign that you won't find outside of Jose Ramirez and Javier Baez at the hot corner. If either one can shake off the 2018 injuries and stay in the lineup this year, both will be absolute steals at their current ADP. 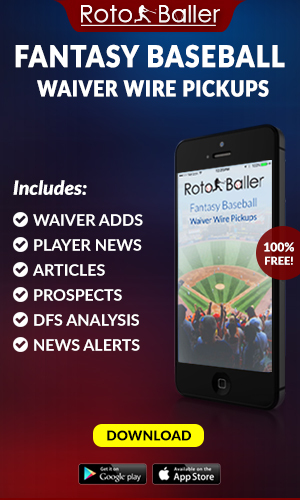 RotoBaller rankings have both hitters ranked at least 20 spots ahead of their NFBC ADP. 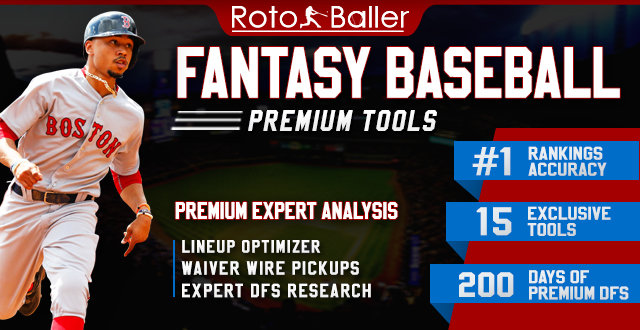 This is your last shot for securing a solid starting third baseman for your fantasy lineups, but there are some good options still available. The first is Matt Chapman, the 25-year-old that enjoyed a very productive first full season in the bigs last year. He hit 24 HR and scored 100 R, while hitting .278. It was a big step forward from his rookie season, as he cut his K% by five points which helped raise his BA over 40 points. Despite "only" 24 bombs, he was 12th in baseball in doubles and boasted a 43.2 Hard%. You could say he possesses "gap power". But if he continues to improve at the plate and build on his impressive 24.5 O-Swing% and 8.8 SwStr%, those doubles will start landing over the fence at a higher rate. I expect a 2017 JRam-type power increase this season from Chapman, and would gladly take him as my starting third baseman in the 7th or 8th round. Justin Turner probably belongs in the same blurb as Josh Donaldson and Wil Myers. 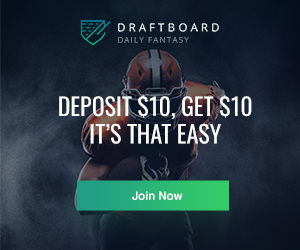 His 2018 season similarly was a letdown to fantasy owners thanks to injuries, and his 2019 ADP has taken a hit because of it. Since the Dodgers acquired him from the Mets in 2014, he has reached 600 PA just once and reached 500 PA twice. Regardless of the injury history, when Turner is on the field there is no doubt he is a fantastic hitter. His BB/K ratios the past two seasons are 0.87 and 1.05, with .312 and .322 BA respectively. Assuming a full season, you can expect low-20's HR, respectable run-scoring production, and a .300 BA. Unfortunately, at the age of 34, that is far from a safe assumption. Undoubtedly the biggest surprise of the 2018 season, Max Muncy exploded for 35 bombs in under 500 PA for the Dodgers after not hitting more than 25 in any of his six seasons in the minor leagues. There is no way he duplicates the 29.4 HR/FB% over a full season, but you can't discredit a guy that owned a 47.4% hard-hit rate hitting in a potent lineup. It's fitting that Muncy and Travis Shaw are right next to each other in our rankings because I view them as having very similar 2019 seasons. Both are CI and MI eligible (depending on your league), which will be a great value boost once the injury bugs start biting your lineups, and both carry big power upside. I don't trust either as my starting first baseman, which is why you want to fill that slot prior to reaching this tier. I was personally burned by Sano in multiple places last season as I predicted him to rebound from his knee surgery and hit a massive amount of HR in 2018. Instead, he had the worst season of his career, and failed to stay up with the big league club or hit above the Mendoza line. His 38.5 K% was the worst in the bigs among hitters with at least 250 PA, EVEN Chris Davis. He is greatly aided by the recent signing of Nelson Cruz, who now can serve not only as a hitting mentor (hopefully) but also lineup protection as Sano works on his approach at the plate. The talent and untapped power are still there, and he's never owned a Hard% under 40%. Still just 25 years old, Sano could prove to be a HR sleeper if you are looking light in the category in the middle of your fantasy drafts. The dual-position eligibility doesn't hurt either. Carlos Santana returns back to Cleveland where HR are handed out to LHB (or switch hitters facing RHP, you get the point) and where he will bat behind two top-five fantasy MVPs. The modest power and RBI potential will prove beneficial at the CI slot or backup 1B in standard leagues, even with the atrocious BA. But if you are in a league of advanced gentlemen and play with OBP instead of BA, bump this dude up two tiers! Regarded as a top prospect not too long ago, Jurickson Profar finally stayed in the bigs for a full season in 2018 and he did not disappoint. The 25-year-old hit 20 HR and stole 10 bases, and starts a nice little run of versatile guys that are great options for those CI/MIF slots in 2019. He made at least 10 appearances at every infield position (besides catcher), and joins an underrated Oakland Athletics squad loaded with offensive potential. He should be manning the keystone position for the A's every day in 2019, and his numbers don't show any strong reasons to believe you can't expect another 20/10 campaign from a guy that you can stick almost anywhere in your fantasy lineup. Profar is the new-shiny version of Marwin Gonzalez. The next super-utility fantasy hitter is a personal favorite, Joey Wendle. Wendle also enjoyed his first full season in the MLB, hitting .300 with 16 SB, while qualifying at 2B, 3B, SS, and OF. The BA won't carry over, as his .353 BABIP is certainly headed for regression. But the Rays have made some upgrades to their lineup and in 2019 Wendle could very well be hitting out of the three hole behind Tommy Pham, and in front of Austin Meadows. It's a sneaky good situation for a sneaky good fantasy hitter. The mid-teen SB is almost a guarantee as he has stolen at least 10 every season since 2013, and that speed mixed with his ultra position-eligibility makes him a great value pick in the later rounds. Eduardo Escobar followed up his solid 2017 campaign with an even better 2018, hitting a career-high 23 HR with a .272 BA. Best of all he was traded to the Diamondbacks, which means he gets to enjoy Chase Field for half his games, with a dabble of Coors in there over the season. His short stint with the new team didn't go very well the first time around, but the modest power will certainly play over a full dose of the desert air. The loss of Paul Goldschmidt hurts every ARI hitter, but regardless the run-scoring opportunities surrounded by David Peralta, Steven Souza, and Jake Lamb plus CI/MI eligibility make Escobar worthwhile at around the 15th round. I love the seventh tier - nothing but upside dart throws here for your bench, but its where the gap between studs and casual fantasy players reaches its maximum distance. The perfect example of an upside dart throw is top prospect Nick Senzel. He's never played an inning at the big league level, but has nothing left to prove down at AAA, where he hit .310 last season. The kids got 20/20 potential with a great BA to boot. The problem is the Cincinnati Reds oddly have nowhere for him to play. Jose Peraza and Scooter Gennett have the MIF locked down, and Eugenio Suarez and Joey Votto aren't moving from their spots on the corners. Rumors were swirling about Senzel seeing time in OF this year to fill the void left by Billy Hamilton, and then the Reds traded for Matt Kemp and Yasiel Puig. Then there's the fact that he is recovering from minor elbow surgery and has vertigo issues. The cons are currently too heavy for me to hitch my wagon to him for 2019, but if he falls in your drafts the skill-set and vast potential is worth a late-round flier. Jeimer Candelario is another intriguing name to stash on your bench. The ex-Cubs prospect played his first full MLB season last year and hit 19 HR while scoring 78 R. There's not a ton to love here, but he is a switch hitter who will play everyday and hit in the top third of the Tigers lineup. He will be a good source of Runs, and is a much better value in daily-roster leagues where you can take advantage of his sexual splits against LHP. (.291 BA, 131 wRC+ in 2018). Don't leave him in there too long though because he will tank your team's BA - which is why I am lower on the 25-year-old than my colleagues. Sneaky sleeper alert! Johan Camargo may seem like a lost cause now that Josh Donaldson is in Hotlanta, but there is still a Nick Markakis-shaped hole in the Bravo's outfield. It just so happens I think Camargo can fill that void. He hits righties and lefties, at home and on the road, and he ended the season with one hell of a second half. After the All-Star break, Camargo hit .295 with 10 HR. Until A.J. Pollock signs a contract with the Braves, I will happily take Camargo 100 spots ahead of Nick, Pierre, and Chris. Even if they do sign a stud OF, Camargo is still going to get 500 PA backing up Josh Donaldson and Dansby Swanson. He's the perfect guy to have on your bench in fantasy.